Home Building An In-House Referral Solution? Don’t Read This Article! The build vs. buy debate is something that product companies battle each day. After speaking with over 300+ customers, we did a thorough analysis and realized that while it may sound easy and the best decision for prospective companies to build their referrals in-house, it soon becomes a parallel product and paralyzes their growth efforts entirely. But before we go ahead and share our insights, we want to address another pressing issue in the ecosystem- the one that questions the need for a referral program. Is Your Product Referral Worthy? The mobile app ecosystem is bubbling with ideas and hacks, and more and more ideas emerge and get tested each day, In-app referrals being one of them. Brands like UBER, Airbnb, and others have successfully managed to use this technique for their app growth, which has further added to their popularity. Having established the need for referrals, most brands jump to the build vs. buy route. 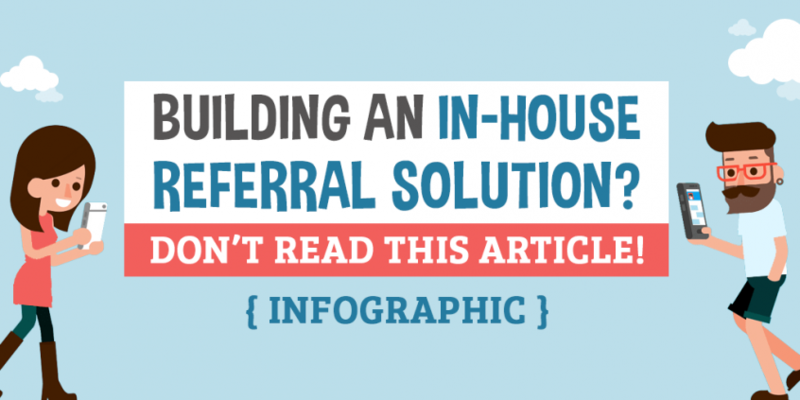 11 Avenues You’ll Be Losing On If You Build Your Referrals In- House. With each executive being his own army, building a referral program is a big step for the team. A simple referral system on an average takes 3-4 months to build, while a more robust one can take up even up to a year. This is often followed by months of testing, implementation, and maintenance not to forget the desire of getting the perfect fit. Buying a referral program will ease the load off the team in terms of production and implementation and will facilitate easy plugin into your established roadmaps. Building and setting up the blueprint of a referral program requires expertise and extensive planning. Marketers that offer such products have an edge in terms of an experienced team that can tackle even the smallest issue as the product shapes up. Given their constant interactions with numerous brands each day, these teams are also adept in optimizing other intrinsic factors as well as evaluating forthcoming hindrances and prevent their occurrence repeatedly. Expertise also impacts speed and efficiency when developing new features as the business evolves. The cost of engineering a referral program is a crucial parameter.The process requires spends on hiring the right resources such as a quality developer, designer, product manager, growth manager and a QA Engineer. We did some quick maths and realized that it can cost businesses nothing less than $2000/day with all the resources on board! Another aspect to consider here is the net profit vs loss while building a referral system in-house. Considering the investment on man and machinery; it may actually be a loss. In case you buy a referral program, it will prevent development losses since such products are still cheap as compared to an In-house built solution. Building a referral program in-house means committing to it for a lifetime. Unfortunately, this doesn’t seem to work and in most scenarios, In-house referral programs go kaput, despite massive investments. A referral program needs to evolve as the business scales. Such upgrades demand retiring old features and adding new features to suit business and user requirements. SaaS marketers, on the other hand, are well adept with such trends as well as adept at upgrading such features for brands right from the original dashboard, given that they work with numerous customers at different scales. Brands that have built an In-house referral solution often lack expertise in handling fraud. Having interacted with numerous such players, we’ve realized that most of these companies don’t even factor it as a part of their blueprint leading to loss at a later stage. Brands such as UBER and Lyft have lost billions due to referral frauds. Given that SaaS marketers deal with multiple clients at one go, they are well aware of various tactics used by spammers to game the system. With this knowledge at hand, they are constantly upgrading their system to keep even the biggest tricksters at bay. Referral solutions that are built in-house often lack the flexibility that marketing teams need. Given their complex nature, these marketers have to constantly shuttle between tech teams to get things resolved. A DIY dashboard is a necessity for running robust In-app referrals and should be readily available to marketing teams minus the constant involvement of the tech side. Having access to a well-set referral program that frees your team from most of the backend duties and gives you more room to grow ahead in the competitive business. What happens when your support staff starts to get overwhelmed with tickets that arise due to referrals? Let’s accept it that it causes mayhem. Apart from fraud prevention, most In-house referrals aren’t built to support query resolution. Resolving customer queries may seem easy at first, but with volume and scale it may become a massive pain and hamper growth due to unsatisfied customers. Detailed analytics are at the center of any referral campaign. Not only do they guide you to the right data set and help you in taking the right business decisions, but also help you gauge what’s working for you and what’s not. An ideal referral campaign should be able to provide you with detailed real time metrics that concern referral such as invites, installs, clicks, revenue, CLTV and influencer data. It is unseen that In-house built systems are adept with such in-depth analytics that is a much-needed ask. A good referral solution requires round the clock monitoring to have the maximum output. Most companies fail to attach a dedicated individual who is an expert on analytics, data testing, and user behavior and can guide the teams with the best referral flow. It makes the whole task a half-hearted attempt to reach goals. Saas marketers behind referral solution are fully equipped and often provide a dedicated growth manager to guide you at each step of the user journey. Building an in-house referral campaign is time-consuming and exhaustive, and constant updates can take a toll on your development machinery. One of the most crucial sections of a referral program is its ability to offer users segmentation. A scenario wherein 60% of your users haven’t ever tried your referral program. What do you do about it? 15% of your users were acquired through the referral program, but they never participated in your referral program, how can you motivate them? In-house referral programs lack the depth of bringing in segmentation within their referrals and brands often miss out on making the most from their data points. Having access to such data can help marketers re-engage them better. We understand that taking a decision of including a new SaaS product such as referrals isn’t easy and needs constant evaluation. If you haven’t been able to digest all the information above, we have an infographic that summates the key points for you below. If you aren’t convinced yet, we’ve some news for you. Building a robust referral program is an uphill task and won’t last long if it lacks these 23 essential features. Apart from the intrinsic factors mentioned in the above article, an excellent referral program reduces the dependence of marketers on their tech-team and is open to customization. Your in-house build referral program will be one side angular piece of your understanding of referral marketing. Integrating with the experts of referral marketing in the industry whose referral program is tested on many levels will provide your business with results in all kinds of possible scenarios. In a fight between buying or building a referral program, businesses should include the above factors. Needless to say that the right approach will make you reach the shore swiftly and seamlessly.